Recline, Put Your Feet Up! Specifically made for commercial use, the Bahia Deck Chairs provide a strong, attractive, highly durable, no maintenance alternative from high-priced seating units. Specifically designed for the food service and hospitality industries, these environmentally friendly chairs are naturally impervious to salt air, chlorine and most common stains. Twice the resistance to UV than the ordinary market chaise. They are stackable and easy to store! 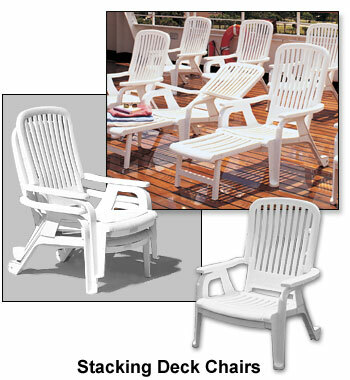 A versatile lounger for pool decks, balconies, country clubs, parks, cruise ship decks and any other resorts. Extra wide seat and back with spacious armrests. Recessed roll-away wheels for easy mobility and quick storage. Three adjustable back positions and pull-out footrest for added comfort. Superior resistance to ultra-violet light. The chairs are rated to 300 pounds and tested in compliance with ASTM F1561-96 Class B requirements for safe commercial use.